Léon Blum was a French Politician who was born in 1872 and died in 1950. He is famous for taking part in a government called Le Front Populaire (Popular Front, that is a coalition of left parties) in 1936 and 37. That is when - among other measures - payed vacations (2 weeks per year), a work week of 40 hours (instead of 48) and the right to strike were enacted. Léon Blum was also Jewish, and for a Catholic country like France, having a Jewish Prime Minister (well Président du Conseil, was the exact term) was really a small revolution! 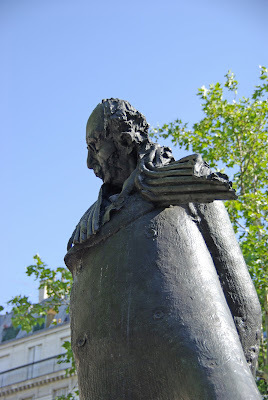 I photographed this statue at Place Léon Blum, in front of the 11th arrondissement Town hall. My, what an ill fitting coat. But he has that French scarf. Yay, Léon! Let's hear it for paid vacation (and I hope you're still enjoying yours, Eric). Nice angle here. He looks like a very thoughtful guy. The statue looks a bit avant-garde, as M. Blum himself seems to have been. Either that or I agree with Wren about the coat! Great tidbit of history, Eric. You touched on a great memory here. We spent a week May last year in the 11th and passed my namesake everyday. Its a wonderful statue which I also have photos of at home. We enjoyed the 11th for its non-tourist neighbourhood. I notice that Monsieur Blum wears his overcoat and scarf in all seasons. A beautiful angle on this, Eric. What a sky! Vive le Front Populaire. Merci pour le weekend, et les autres. A shame that events conspired against Leon Blum. His heart seems to have been on the right side. Is two weeks paid vacation still the standard or do people generally have more? That's pretty typical starting paid vacation here in the states and I think it's such a paltry amount. Life is meant to be lived not just spent working. Paid Long service leave after 10 years of 6 weeks or more ( I forget now but we spent 7 in France) I think and then another lot after 15 years.